My friend Gemma, a published novelist, screenplay writer and mama recently posted a hysterical photo of her family. The photo depicts her husband, also a hard working dude/dad in the bathroom with their two kids. It’s one of those scenes that you totally recognize as a parent. One kid is on the potty (obviously he’s been sitting there for quite a while) while the other is sort of hyperactively gallivanting around. Dad is perched uncomfortably on the ledge of the tub and mom is snapping a iphone photo for posterity. The parents are both at once exasperated and in love with their kiddos. They wouldn’t have it any other way but boy oh boy can those weekends be relentlessly long. As a parent there are many moments of blissed out joy and many moments that can stretch you to your max. Therefore, the idea of returning to your your other passion on Monday can actually be a respite. 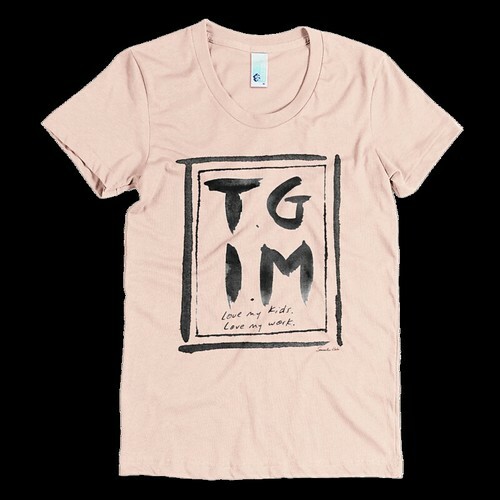 I commented on Gemma’s photo with this “T.G.I.M” and she proclaimed, “I need that shirt!”. You asked, I answered dear Gemma. I need it too. I love my kids. I love my work. The shirt is now in my shop if you want it. 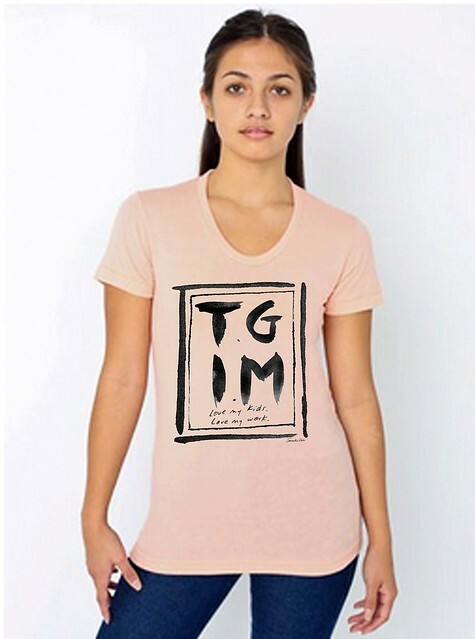 It’s printed on a beautiful apricot colored, soft, scoop-neck American Apparel T-shirt. Get it here!